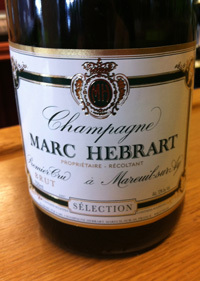 n.v. Marc Hebrart, Selection, Premier Cru Brut Champagne, Mareuil-sur-Ay, France. This fine and detailed sparkler was from the May 2012 disgorgement of the Marc Hebrart Selection cuvee and it is perfumed and lovely from start to finish, highlighting the deft touch and quality of this Champagne house to make some of the most refined grower bubbles available. The whole lineup impresses from Rose to Grand Cru Extra Brut, but this Brut Selection cuvee is a fantastic Champagne at a great price. The nose is elegant with white flowers, citrus and pure apple notes leading to a palate with a delightful mousse and subtle grace showing green apple, pear and lemon fruits with brioche, baked/poached apple and bead dough. The Marc Hebrart Selection seduces throughout and makes for a great example of why we search out these terroir driven and handcrafted artisan Champagnes, they are interesting and soulful. 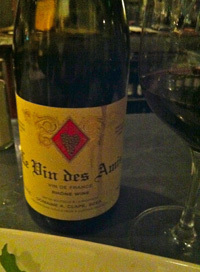 2011 Domaine Auguste Clape, Le Vin des Amis, Rhone Red, France. This is flat out beautiful Syrah, think baby Cote-Rotie, and much credit to Pierre-Marie Clape for giving us a wonderful and easy on the wallet wine that delivers amazing quality and depth in a graceful package. There is no question, the talent of Clape is beyond any doubt and while collectors drool over his ultra Syrah from Cornas and the family plots, this little wine is amazing in it’s own right and much more easily available and so drinkable. While the Clape Cornas is a wine that is rewarded by lengthy cellar time, this Le Vin des Amis is a wine to drink now, and often for sure, with smooth tannins and remarkable refinement for a wine in it’s class and the vintage. The 2011 Le Vin des Amis opens with a parade of violets, pepper, lavender, anise and blue fruits giving beautiful a perfume and earthy elements which lead to boysenberry, blueberry and cherry fruits with tangy plum and truffle notes adding complexity and detail. There is a sharp cinnamon stick note that runs the length of this pretty Syrah and lingers on and on with the violets and a light berry fruit compote essence. Look for this gem to drink well over the next 2-5 years, filling out a bit and gaining maybe a more meaty component, though I would be hard pressed to not drink it up young. 2010 Amelle, Pinot Noir “La Cruz Vineyard” Sonoma Coast. This vibrant and bright flavored Pinot is just starting to fill out and there is more potential to become an even more complete wine, though it is charming and nice now. Sourced from Keller estate’s La Cruz site, high on a ridge top near Petaluma, this Pinot Noir shows cool climate characteristics, but is still has nice ripe round flavors. The nose is tangy shy still with hints of currants, pepper, roses and earth leading to a tense palate of cherry, plum and cranberry fruits, plus hints of candied citrus, truffle, light wood notes and anise. There is a core of silky red fruits that stays throughout and the crisp tight finish softens with air and allows a long aftertaste of kirsch and dried flowers. This needs a bit more time to come together, but it looks set to be a very fine Pinot, best to enjoy between 2013-2015. 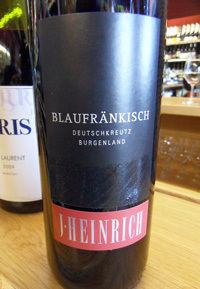 2011 J. Heinrich, Blaufrankisch, Deutschkreutz Burgenland, Austria. Heinrich’s fresh and delightful Blaufrankisch from Burgenland is a winner for quality and price and is a good starting point to explore this varietal, especially as this wine shows the grape in such a pure style without oak or any funk. The last few vintages of J. Heinrich Blaufrankisch have been fun and easy wines and the 2011 is much the same, but with a bit more acidity and zest, though it should mellow and fill out a touch in the coming months, but it is a wine that should be enjoyed young with vibrant fruit and spice showing now. The nose has hints of flowers, spice and olive notes with dark fruits and a hint of bell pepper, it reminds me a little of a Loire Cab Franc, but darker and smoother without being heavy. The palate has silky black cherry, plum and loganberry, touches of earth, mineral and herbs add a bit of interest as well. This wine is not the most complex of Blaufrankisch examples, but is very nice and drinks well. Austria’s signature red grape is getting a fair amount of attention these days, but it still remains somewhat of a fetish wine and has not gained a mainstream following in the States as of yet, though it is worth checking out. I know I reviewed this wine already, but I thought it would be relevant to update as it has really changed in the last four months and in dramatic fashion for the better even, and I might have have been a bit quick to review this one in the first place. The latest Vinolocity Blanc is a white Rhone style cuvee of Grenache Blanc, Roussanne and Viognier coming mostly from cool coastal sites and crafted by the artisan winemaking team of husband and wife, Dylan & Tobe Sheldon at their micro winery in Santa Rosa. Having followed Sheldon since they began and being friends prior, I am of course somewhat bias, but sometimes a bit critical too, as things go, though I am really enjoying the evolution of their style and the latest set of wines are certainly outstanding wines full of character and unique. 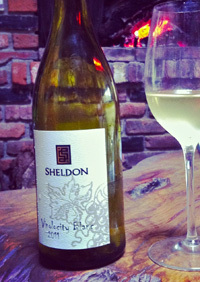 The 2011 Sheldon Vinolocity Blanc is one of my favorites, I had said much the same about the 2009 Naris and the 2010 Vinolocity Blanc, but this new wine has really developed beyond expectations and blossomed in depth and richness with loads of texture and length. The nose has come around too with hints of white flowers, mineral and peach notes leading to a round and full palate of apricot, pear, peach and tropical citrus with a creamy butterscotch and apple butter element, plus hints of pepper and star anise. Overall it is the balance and texture that shine throughout and make for comparisons with fine white Rhone wines, along with the heightened pleasures of the layers of flavors that unfold and linger on the finish. This wine has plenty of acidity and slightly lower alcohol, making it easy to drink and I can say it went very quick at Christmas dinner, so I it might be best to have more than one bottle around. 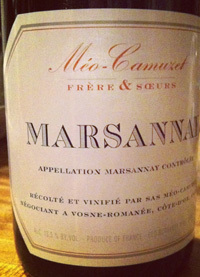 2009 Meo-Camuzet Freres & Soeurs, Marsannay AC, Red Burgundy. Always one of my favorite wines, the Meo-Camuzet Marsannay is a little beauty and made for a great Christmas treat this year, showing lovely now. The nose is detailed with fruit, flowers and earthy essences leading to a silky rich palate of red currant, black cherry, plum and brambly raspberry fruits, truffle, licorice and tea spices with a streak of minerallity running through out. Hints of game, lively acidity and a saline note all make for a very complete wine that shows focused Pinot Noir character and class. Sometimes expectations make for a bit of a let down with Burgundy, but this fine example brings loads of pleasure and leaves a big smile, this was a great showing for the 2009 Meo-Camuzet Marsannay and I’m glad I have another few bottles stowed away. 2010 Anthill Farms, Syrah, Sonoma Coast. A great little wine with nice texture and flavors that reflect the cool climate sites the winery sources from. The 2010 is medium weighted with a good range of dark fruits, mineral and spice notes and heightened acidity with hints of game and earth. The nose has red currants, floral essence and truffle notes leading to a zesty palate that shows blueberry, cherry and plum fruits, cassis and peppery spices while the body expands in mouth a bit with air and the length is pretty good, especially given the very modest price. Anthill Farms continues be a great source for fine artisan wines, mostly of their Pinot Noir, but their little Syrah bottling are great finds and you should grab them if you can find them. 2009 Pahlmeyer, Red (Cabernet Sauvignon Blend) Napa Valley. 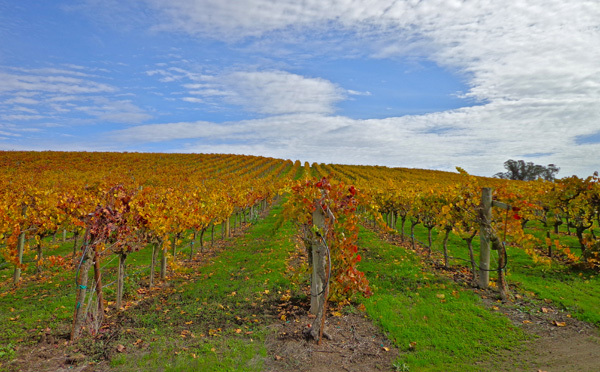 Pahlmeyer is a modern classic Napa wine and this latest vintage shows all the characteristics that have made it so popular over the last almost two decades with bold ripe fruit, smoky sweet oak and full bodied texture. While opulent and rich there is plenty of tannin to keep things firm and at this stage decanting is a must and better still would be patience and 3-5 years in the cellar. I tried the Chard and the Jayson Red as well, but while the Chardonnay is everything you’d ever want, the Jayson red really disappoints in this vintage, so it is clear the best work went into this 2009 Pahlmeyer Red as it is really complete and dense with pure Cabernet flavors, blackberry, cassis, currant and plum fruits as well as vanilla, sage, cedar and hints of licorice. With air this wine really comes together and flows in beautiful unfolding layers and the finish is super lengthy without being cloying or overtly oaky. I would bet on a higher score and more complexity in a few years time, as there is plenty of potential to improve here. Another gem from Telmo Rodriguez of Remelluri fame and who has an incredible list of great wines to his name and who has worked some of the most interesting terrors, he even had a spell working for Jean-Louis Chave in Hermitage! 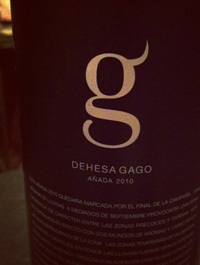 The Dehesa Gago is a pure Tempranillo red with deep color and a depth of layers with rich flavors and nice smooth tannins. This easy to love round wine shows deft and subtle winemaking and allows loads of pleasurable fruit to shine throughout. The nose has hints of earthy fruits, spice and mineral with a palate of red currants, cherries and plum with hints of toffee, new leather and full bodied textures, and the lengthy finish is of soft oak and cassis.